Seale is a talented political writer whose first book, The Struggle for Syria (1965) remains a minor classic of Middle East studies. All the more pity, then, that he sold out to become the Syrian regime's leading apologist in the West. Passages in Asad of Syria recall the old talent, for Seale can write deftly about the subject of his biography, Hafiz al-Asad, as well as the whole course of Syrian history. Also, Seale turns up much new information about Asad's life before he became president of Syria in 1970. But two-thirds of the book deals with events since 1970, and here Seale provides not much new information and few insights. He paints a picture of Asad so hagiographic, the reader can only hope it was as painful for Seale to write as it was for me to read. Seale obsequiously swallows every lie put out by the hacks in Damascus, accepting even the claim that Nizar al-Hindawi, the man who tried to blow up an El Al plane in 1986, was a double agent controlled by Israel. With cruel audacity, he deems Asad - who in 1982 called out the air force to bomb the Syrian city of Hama, killing tens of thousands - a man who seems to "abhor violent confrontations." Similarly, he presents Asad, the Arab ruler with the greatest number of Arab enemies, as a "statesman" who best "represents the Arabs' aspirations to be masters of their own destiny." Why does a university press consent to publish so obvious a whitewash? Was it naive or complicit? 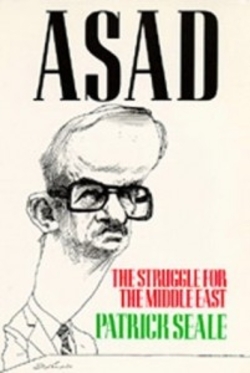 California is hardly the first university press to endorse Middle East thugs (Columbia University Press in recent years has made a sub-specialty of lauding the PLO), but Asad of Syria is perhaps the most disgraceful book yet to appear under the imprimatur of a major scholarly house. Feb. 18, 1992 update: For an even more awful book by the same author, see my review today of Abu Nidal: A Gun For Hire.